Four drivers of the former British Road Services lived and worked together for two years, loading and transporting 20,000 tons of cement in 7 ton loads from the little railway station at Killin, up the craggy mountain roads of Glen Lyon, a beautiful glen largely by-passed by 20th century road builders, for the building of the Giorra Dam. The dam is the starting place for 'bagging' the two Munros - Meall Buidhe and Stuchd an Lochain. But first there is the challenging drive to get there. It is best to follow the long single track road from the east near Aberfeldy, but there is the option of the more demanding single track road that climbs over the Ben Lawers range from near Killin. Once in Glen Lyon continue well west of any significant habitation and take the even more minor road that leads a further 2 miles/3.2km north west from the glen to the dam at the head of Loch an Daimh where there are a number of places to safely leave a car off the road. Both hills can be climbed individually starting from the dam and then retracing your steps, but this walk takes a circular route around the loch, and also includes the Corbett Sron a Choire Chnapanich. The water level of Loch Giorra, that was merged with Loch an Daimh when it was dammed to form a reservoir, is at about 430m/1,411 feet above sea level. With the summit of Stuchd an Lochain at 960m/3,150 feet, the height gain is only 530m/1,739 feet and that represents almost half the climb before even setting foot on the hill! Follow the road to the south past the face of the dam, then the obvious, if steep, grassy track south-southwest up Coire Ban to the ridge at a line of fence posts. 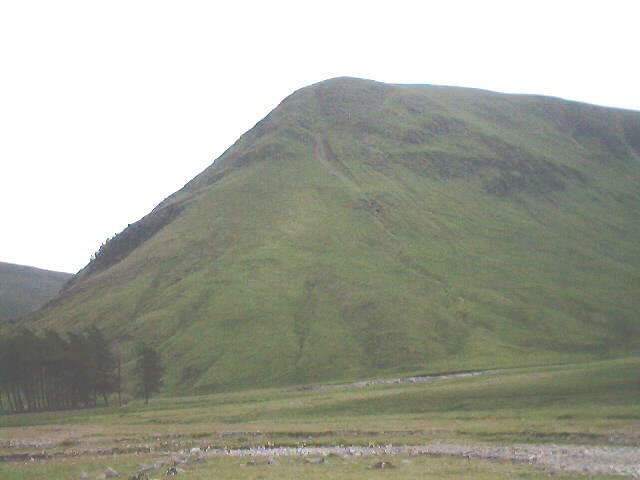 Follow the ridge west from here to the summit of Stuchd an Lochain. The circular Lochan nan Cat beneath the summit looks quite bizarre. Follow the fence line down the ridge west to Meall an Odhar before descending steep slopes beside a burn to Loch an Daimh. The Corbett Sron a Choire Chnapanich, that lies ahead however, needs a lot of energy but adds to the enjoyment of the day! If taking on the Corbett, continue to follow the fence line southwest to the Bealach a' Mhaim at 631m/2,070 feet, then north-north-east up an easy sloping, wide ridge to the summit. There are a couple of options for the descent; one is down the steep north-west grassy slope to the burn then out to the head of the loch, the other is to continue northwards and then down a gravel track. Whichever is chosen, exercise great care when descending. Once in the valley, at the west end of the loch, cross over the wide burn then it is another punishing hike up steep southerly slopes to Meall Cruinn. There is a track up the right hand side of a gully that starts to the left (west) of a small stand of trees and bears right a short distance up. From the summit of Meall Cruinn it is well worth taking a compass bearing to Meall Buidhe since, in the fashion of less popular Scottish hills, the path becomes indistinct in places, and there is more than one route visible (if at times barely so) on the ground. Laziness could lead the unwary off course to Coire Uaimh which, whilst very pleasant, isn't the place to aim for. Embedded in the summit cairn on Meall Bhuide (931m/3,055 feet) is a memorial dedicated to two hillwalkers, Bobby Stirling and Willie Young, who were both in their eighties when they died. A nice place to be remembered. From the summit of follow a wide track along the edge of the Glas Choire, then it's a steady tramp south across the heather before swinging east to Meall a' Phuill then south again, gently descending back down to the dam. On a clear day the views from the summits are superb - Glen Coe and Rannoch Moor to the west, round to the Glen Lyon horseshoe and Schiehallion to the east. Map OS Landranger sheet 51 or OS Explorer sheet 378. Start/parking Giorra Dam, grid ref 510463.Parking near to the base of the dam. It can be quite a busy spot on a good day. Grading A strenuous walk recommended only for the very fit. Navigation skills must be up to par, as this is not a good place to get lost. The vagueness of the paths on the ground and the proximity to some pretty wild country make this an outing to be treated seriously. Allow between 7 and 9 hours. Sheep grazing so dogs on the lead.